Global Driverless/Self Driving Car Market is Expected to Grow at a CAGR of 17.22% between FY2020 to FY2025. Driverless/Self Driving cars are set to revolutionize Global automobile market. As manufactures are busy developing and testing their prototypes for driverless cars many companies are looking at using these vehicles for commercial taxi services. The need for safety, rising demand of point to point travel, increasing urban population, awareness about road safety, rising vehicle sharing needs, more freedom with driverless cars, etc. are expected to fuel the demand for driverless/self-driving cars in market. Most of the major car manufacturers are planning to launch their driverless / self driving cars by FY2020. 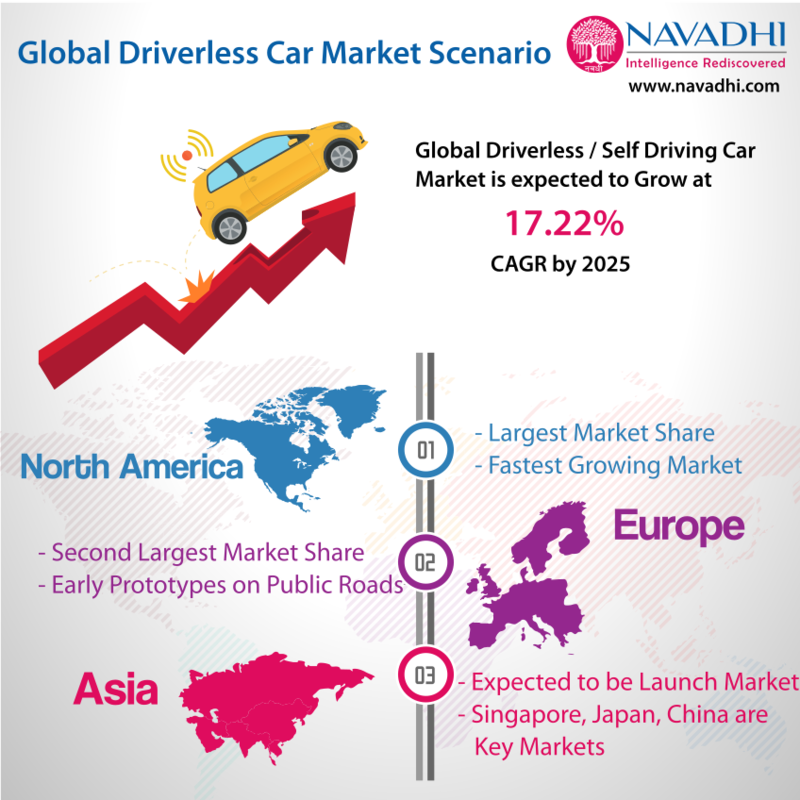 As per NAVADHI Market Research the driverless cars industry is expected to grow at a CAGR of 17.22% between FY2020 to FY2025. The growth in this market is predicted on the basis of various factors like market drivers, current and upcoming trends, current growth pattern, and market challenges. NAVADHI has studied this market and had analyzed the driving forces behind the success of this industry globally. The report provides in-depth analysis for the driverless/self-driving car market for the year FY2020 to FY2025, including market structure, market trends, market constraints and industry drivers. The factors driving the global driverless/self-driving car market are safety, hassle free parking, more leisure hours, less congestion etc. In terms of geographies, North America is expected to control the largest market share in Global driverless/self driving car market. As per NAVADHI estimates, North America driverless/self driving car market is expected to show highest growth till FY2025 among all geographies. Spanning over 105 pages and 72 exhibits, “Global Driverless/Self Driving Car Market 2025” report presents an in-depth assessment of the Global driverless/self driving cars market from 2020 till 2025. The report has detailed company profiles including their position in Global driverless/self driving cars market value chain, financial performance analysis, product and service wise business strategy and SWOT analysis for 8 key players in Global driverless/self driving cars market namely Aktiebolaget (AB) Volvo, Alphabet Inc. and Google Inc., Bayerische Motoren Werke AG (BMW), Daimler AG, Ford Motors Company, General Motors Company, Nissan Motor Co. Ltd and Toyota Motor Corporation. This report provides detailed information about Global Driverless/Self Driving Car market including future market forecasts. This report provides detailed information on geography wise (Asia Pacific, Africa & Middle East, Europe, South America and North America) growth forecasts for global driverless/self-driving car market up to 2025. The report identifies the growth drivers and inhibitors for global driverless/self-driving car market. This study also identifies various environmental policies related to global driverless/self-driving car market. The report identifies various credit, policy and technical risks associated with global driverless/self-driving car market. This report has detailed profiles 8 key players in Global Driverless/Self-Driving Car market covering their business strategy, financial performance, future forecasts and SWOT analysis. This report covers in details the competitive landscape in Global Driverless/Self Driving Car market. This report provides PESTLE (political, economic, social, technological, legal and environmental) analysis for Global Driverless/Self Driving Car market. This report provides Porter’s Five Forces analysis for Global Driverless/Self Driving Car market. This report provides SWOT (strengths, weakness, opportunities and threats) analysis for Global Driverless/Self Driving Car market. This report identifies the key challenges faced by new players in Global Driverless/Self Driving Car market. This report provides future trends and opportunities for Driverless/Self Driving Car market globally. This report also provides strategic recommendations for policy makers, end users, car manufacturers and investors. 8.1 Alphabet Inc. and Google Inc.
8.1.3 Financial Performance of Alphabet Inc. and Google Inc.
8.1.4 Business Strategy of Alphabet Inc. and Google Inc.
8.1.5 SWOT Analysis of Alphabet Inc. and Google Inc.
8.2.3 Financial Performance Nissan Motor Co. Ltd.
8.2.4 Business Strategy of Nissan Motor Co. Ltd.
8.2.5 SWOT Analysis of Nissan Motor Co. Ltd.
Exhibit 8.1.1 Key Information of Alphabet Inc. and Google Inc.
Exhibit 8.1.2 Contact details of Alphabet Inc. and Google Inc.
Exhibit 8.1.7 SWOT Analysis of Alphabet Inc. and Google Inc.
Exhibit 8.2.1 Key Information of Nissan Motor Co.
Exhibit 8.2.2 Contact details of Nissan Motor Co.
Exhibit 8.2.7 SWOT Analysis of Nissan Motor Co. Ltd.
Exhibit 8.5.1 Key information of Ford Motors Co.
Exhibit 8.5.2 Contact Details of Ford Motors Co.